This is the city of Mecca (also writen Makkah), located now in Saudi Arabia. The land as that day and still today is barren, desert area. The offsprings mentioned are the bloodline of Abrahama from his son Ishmael and his discendants. Both according to Arab tradition and Bible, Ishmael's descendants were settled in Arabia. This sacred house is the house that Abraham erected with his son for the purpose of worshiping of God, the One. Abraham in all three monotheistic religion, Judaism, Christianity and Islam is given the credit as the father of monotheism. And the beginning of this journey started with the sacred house, called Kaba. As an ancient architecture it was very simple and made like a cube. 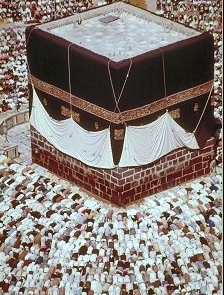 Hence the name Kaba, which simply means 'cube'. Literally also means, a high place with respect and prestige. Father Abraham's prayers were heard and accepted by God indeed. 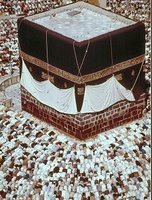 From hundreds of years, millions of peoples' heart are made to yearn towards the house, Kaba where people go for sacred pilgrimage. At this moment about 3 million people are gathering there to answer the call of the their heart's yearning & longing to visit the sacred house.